I am very happy that I can officially write: a web version of the GTD Simple application, the GTD Simple Web, was created. The application is available at https://gtd.md-lab.pro. It is currently in the Alpha version, which means that not everything works as I would like. The works are still under way, so the functionality and reliability will grow. Marking selected tasks with a star. Some minor things that I have not mentioned here. I tried to keep the graphic and functional similar to the android version. This is not a one-to-one similarity, but I think I managed to keep a big similarity. Hence, it will be easy to use the current GDT Simple to use both versions interchangeably. Most importantly – both the smartphone and web version use the same database. Thanks to this, the data is automatically synchronized between the two versions. 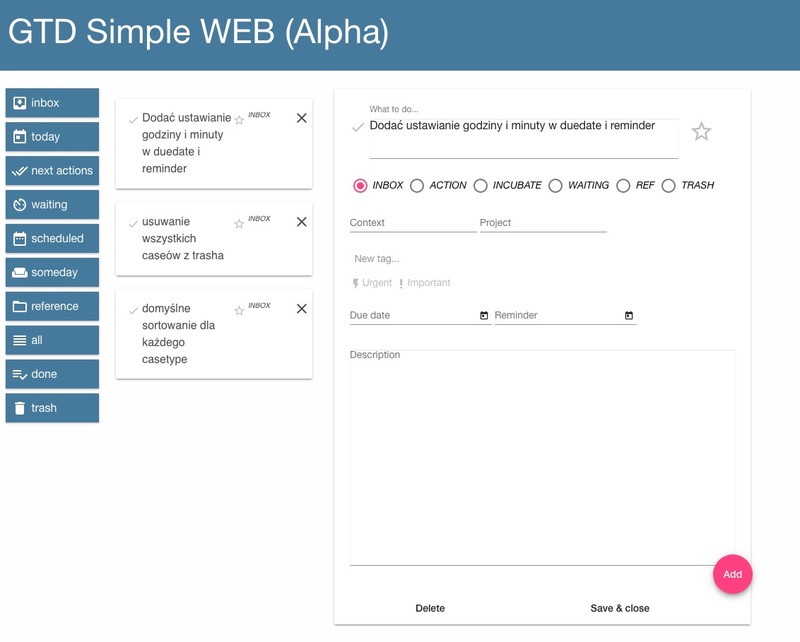 GTD Simple Web Alpha version is free. GTD Simple Web is intended primarily for computers. I checked the operation of GTD Simple Web on a smartphone and tablet. Conclusions? On the tablet (Android) it is quite well, but it is much better to have a native application on your smartphone then trying to work with this web version. Unfortunately, I did not have the opportunity to check how GTD Simple Web on devices from the iPads family. If anyone of you can check it out, I will be grateful for the information. And finally, I would like to remind you the GTD Simple Web address: https://gtd.md-lab.pro. Génial, c’est une superbe initiative ! Un vrai plus qui va faire de cette application un vrai must ! Plus rien à envier par rapport aux ténors du marché comme todoist. En plus votre application respecte vraiment les principes GTD. Bravo ! J’en profite pour faire une observation en comparant les version alpha pour le web et android. La recherche “Important” ne fonctionne pas sur la version française. Alors que sur la version web ça fonctionne bien. About the ‘Important’ issue – I will investigate that. However there is no search at Web version as far as I know. I will check what is happening on French version. the WEB version is still in Alpha phase so not all the functionalities are present. Currently it is rather dedicated as a secondary user interface, and Android Application is the primary one. Hi – I see, thx.